This is the first in a series of Apollo 50th anniversary Featured Images the LROC team will post over the next four years. The series begins today with Apollo 7 and ends with the triumphant lunar science mission of Apollo 17. Along the way we'll release new image products related to NASA's 1960s March to the Moon and other Apollo-related content. In July 1962, NASA announced that it would send humans to the Moon using the Lunar Orbit Rendezvous (LOR) method. After a debate that lasted a year, NASA had settled on LOR as the mission method most likely to achieve the goal of a man on the Moon by 1970. LOR would use two spacecraft, each of which would include two modules. Today's Featured Image spotlights the Command and Service Module (CSM), the Apollo mission mothership, which was made up of the Command Module (CM) and the Service Module (SM). 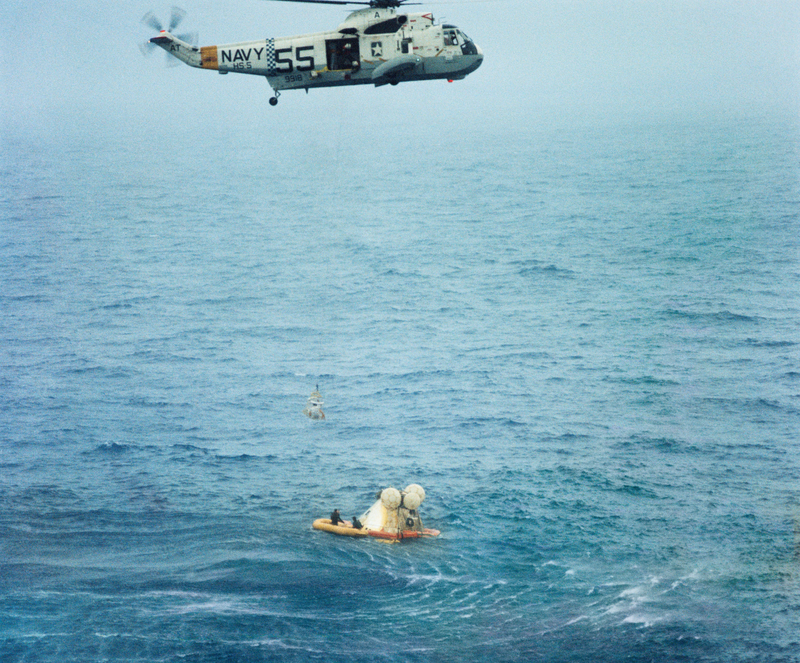 The conical CM carried the three-man crew, and included the heat shield and parachutes they would need to reenter Earth's atmosphere and descend to a splashdown in the ocean at the end of their mission. The drum-shaped SM included the Service Propulsion System, the CSM's main engine, as well as life support supplies, radiators and electricity-producing fuel cells, four clusters of steering rockets, and communications antennas. The Apollo 7 CSM lifted off from Launch Pad 34 at Cape Kennedy, Florida, on 11 October 1968. It rode a Saturn IB rocket designed for Earth-orbital Apollo flights. 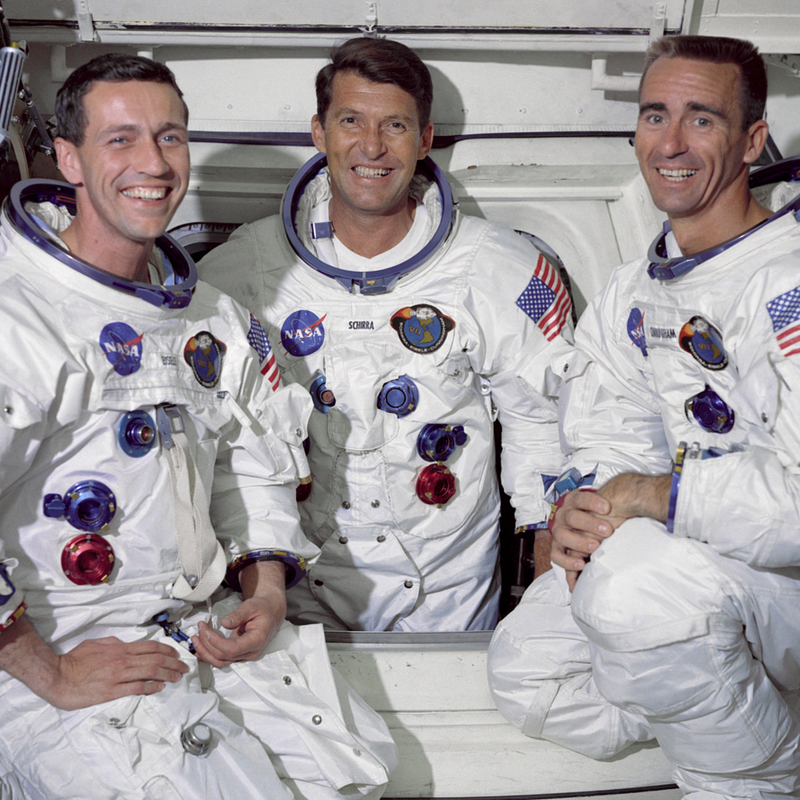 On board were Commander Wally Schirra, Senior Pilot Donn Eisele, and Pilot Walt Cunningham. The Apollo 7 launch carried a hint of somber deja vu, for nearly two years before (27 January 1967), the Apollo 1 fire had killed astronauts Gus Grissom, Ed White, and Roger Chaffee in their CSM on Pad 34 just three weeks ahead of their mission to test the CSM in Earth orbit. The fire revealed flaws in CSM design and quality control. It did not halt America's march to the Moon, but it did redirect it. No astronauts flew while NASA and the CSM prime contractor, North American Aviation, fixed the CSM. At the same time, NASA and Congress performed a wide-ranging review of the entire Apollo Program. The space agency made changes throughout Apollo, enhancing safety and the likelihood that the program could succeed in its goal of putting a man on the Moon by 1970. A major CSM fix was a new hatch that could be opened from the inside in just seven seconds. The Apollo 1 hatch had needed almost two minutes to open, blocking the Apollo 1 crew's escape. 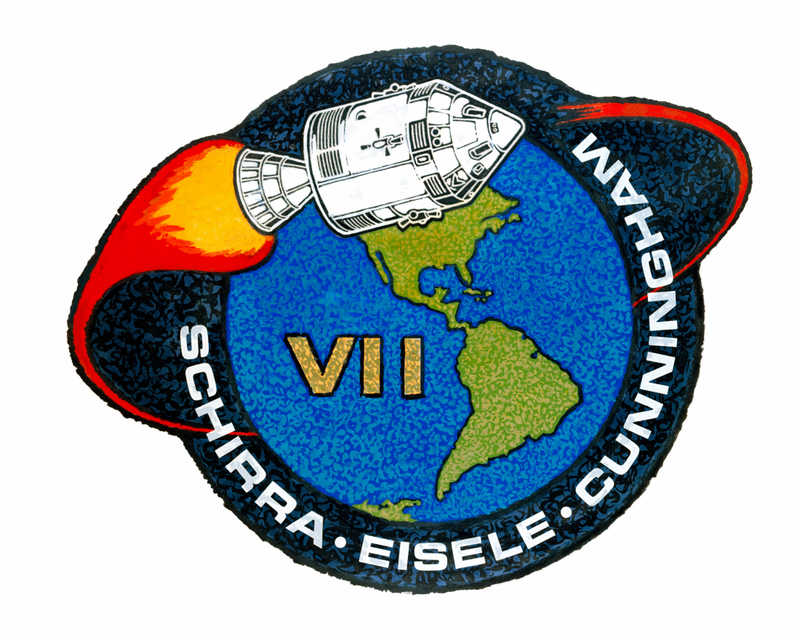 The Apollo 7 mission emphasized maneuvers the CSM would need to carry out during lunar missions. Schirra, Eisele, and Cunningham performed several rendezvous maneuvers with the second stage of the Saturn IB in Earth orbit. Called the S-IVB, the stage was big and, with its propellants expended or purposely vented into space, mostly empty. This meant that the very thin atmosphere in low-Earth orbit could quickly slow it so that gravity could pull it down to Earth. 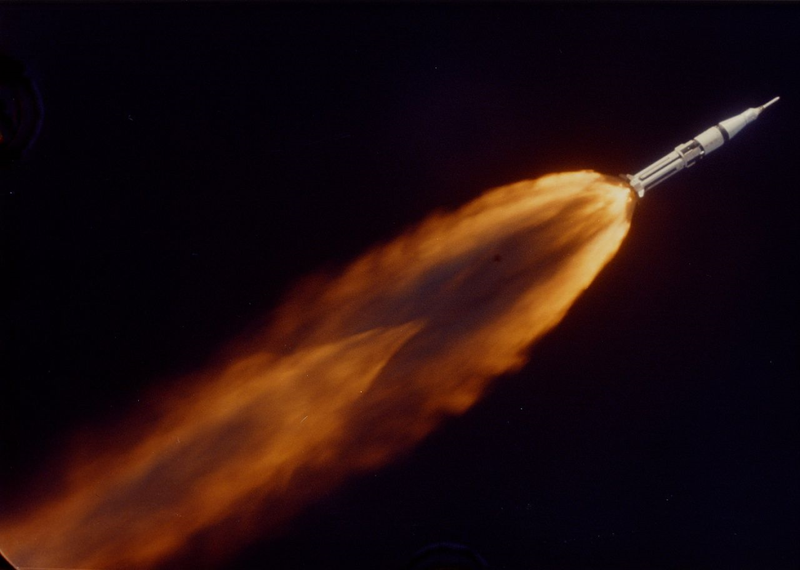 For several days, the Apollo 7 crew test-fired the Service Propulsion System engine to lower their orbit to keep up with the descending S-IVB stage. On 18 October 1968, however, the S-IVB reentered the dense part of the atmosphere over the Indian Ocean and was destroyed as planned. The Apollo 7 crew, meanwhile, raised their orbital altitude using the Service Propulsion System so that they could continue their test flight. The final test of the mission, return to Earth, began with the eighth firing of the CSM main engine over the Pacific Ocean near Hawaii. Schirra, Eisele, and Cunningham turned the spacecraft to point its main engine forward, then ignited the engine to slow it. Soon after, they separated the SM from the CM. The SM would burn up in the atmosphere as planned. The crew fired thrusters to orient the CM's blunt, bowl-shaped heat shield for reentry. Soon, they began to feel heavy as atmospheric drag put the brakes on their capsule. Outside the CM's small windows, they could see bright fire. As the CM passed through the atmosphere, it compressed and heated the air in front of its dense honeycomb heat shield. As planned, the heat shield melted and burned as it protected the astronauts from reentry heating. Finally, with blue sky shining in the windows, the Apollo 7 crew released a series of parachutes, ending with three orange-and-white main parachutes. The spacecraft splashed into the Atlantic only 13 kilometers from the prime recovery ship, the Navy aircraft carrier U.S.S. Essex. Helicopters and frogmen soon retrieved Schirra, Eisele, and Cunningham. The CM, its skin scarred by the heat of reentry, was hoisted aboard the Essex. Apollo 7 was to be followed, logically enough, by Apollo 8, which had long been planned as a piloted mission to test a CSM with the other LOR mission method spacecraft, the Apollo Lunar Module (LM). A mighty Saturn V Moon rocket, the first to carry a crew, would launch the Apollo 8 spacecraft into a high Earth orbit. However, the "lem," as the LM was known, was not ready, so it was formally deleted from the flight in September. 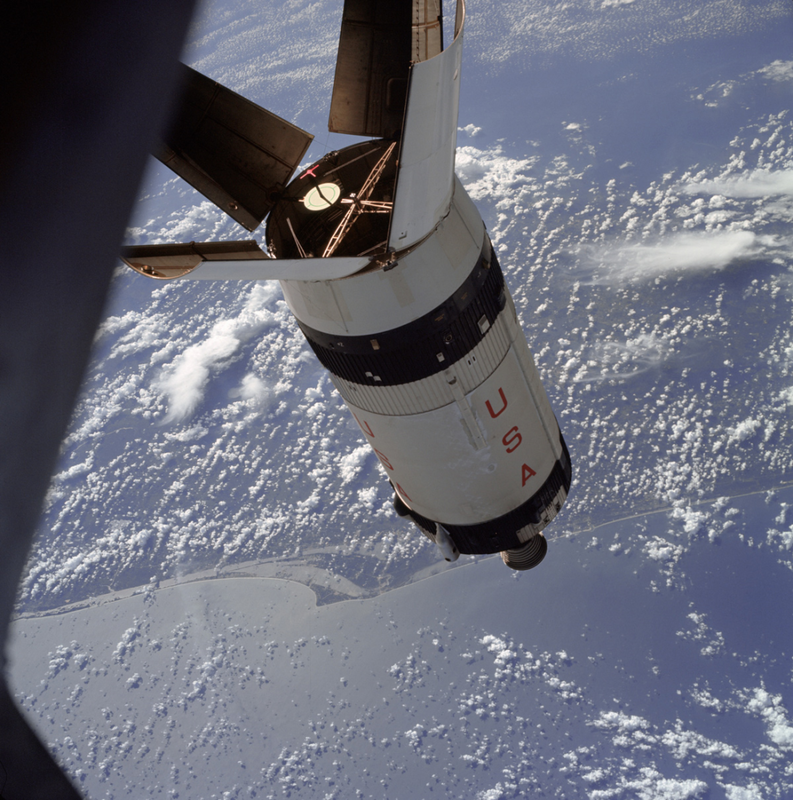 By the time Apollo 7 flew, Apollo 8 had been changed to a CSM-only, Saturn V-launched flight into a high Earth orbit. Managers and engineers throughout the program felt that the planned mission would, however, be redundant. Some argued for a much more ambitious Apollo 8 test flight. 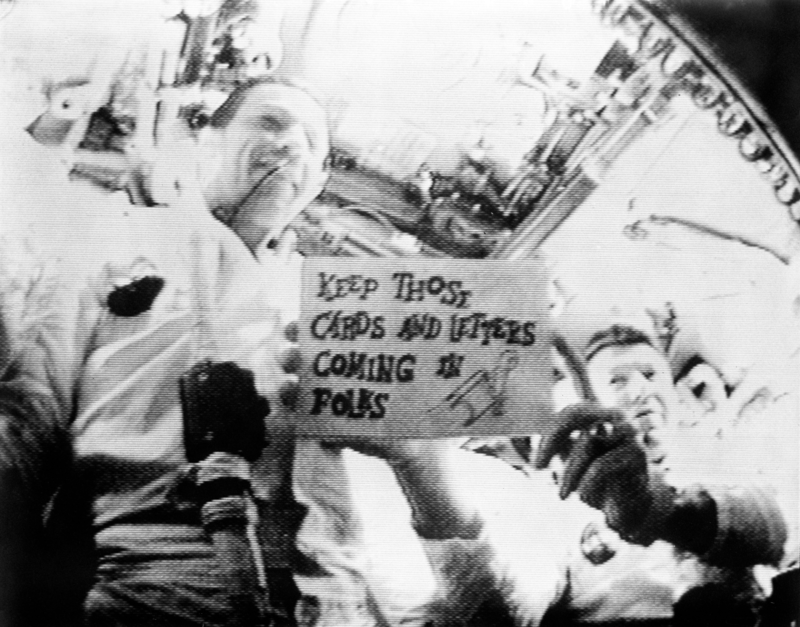 On 12 November 1968, citing the successful Apollo 7 mission, NASA announced to the world that Apollo 8, scheduled for December 1968, would not merely orbit the Earth. Instead, the Apollo 8 CSM would travel 383,000 kilometers from Earth and orbit the Moon.